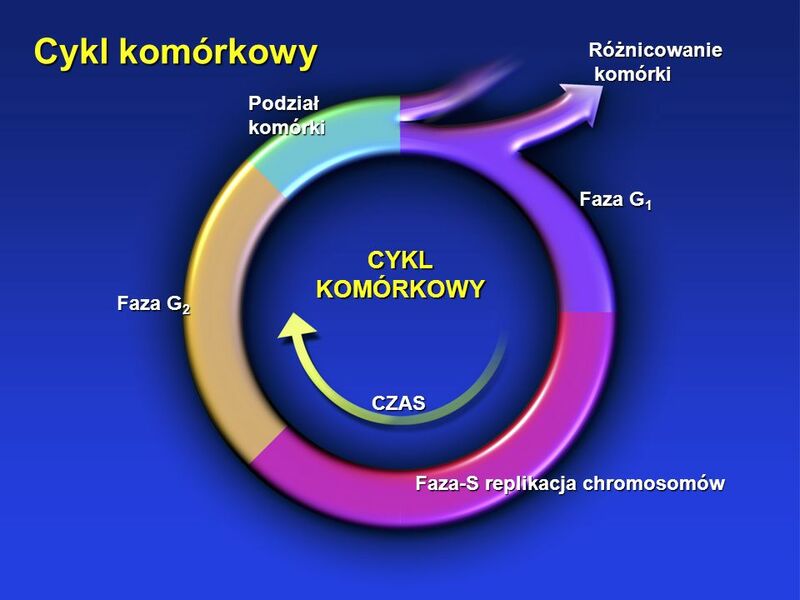 Wybiórcza toksyczność oparta na różnicach pomiędzy komórkami nowotworowymi i zdrowymi Leki przeciwnowotworowe śmierć komórki hamowanie wzrostu komórki hamowanie różnicowania 1. 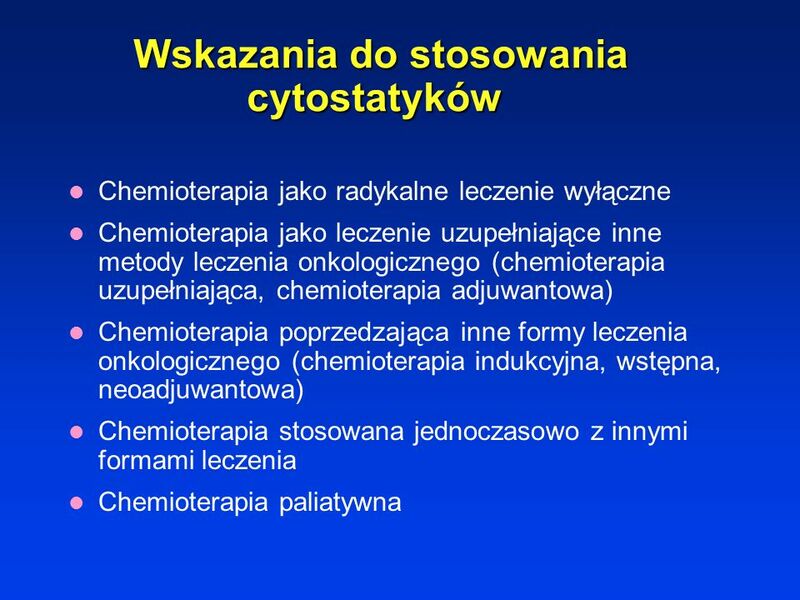 Cytotoxic Agents: Effects of Chemotherapy The beneficial effects of cancer chemotherapy derive from the selective toxicity of these agents. Selective toxicity is based on characteristics, such as metabolic requirements or patterns of gene expression, that may distinguish rapidly-growing cells from normal cells. Clinically useful agents may be cytotoxic by inducing cell death through specific or nonspecific mechanisms. Alternately, they may be cytostatic by suppressing malignant cells without inducing cell death. Some agents may exert their effects by actually inducing cell differentiation. 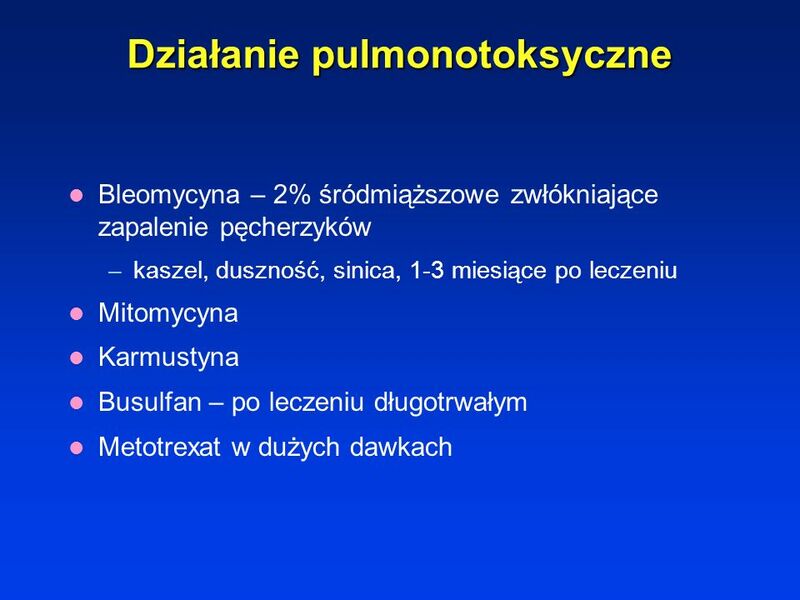 Pochodne iperytu azotowego (cyklofosfamid, melfalan) Pochodne nitrozomocznika (karmustyna, lomustyna) Inne leki alkilujace (prokarbazyna, busulfan, dakarbazyna) 3. 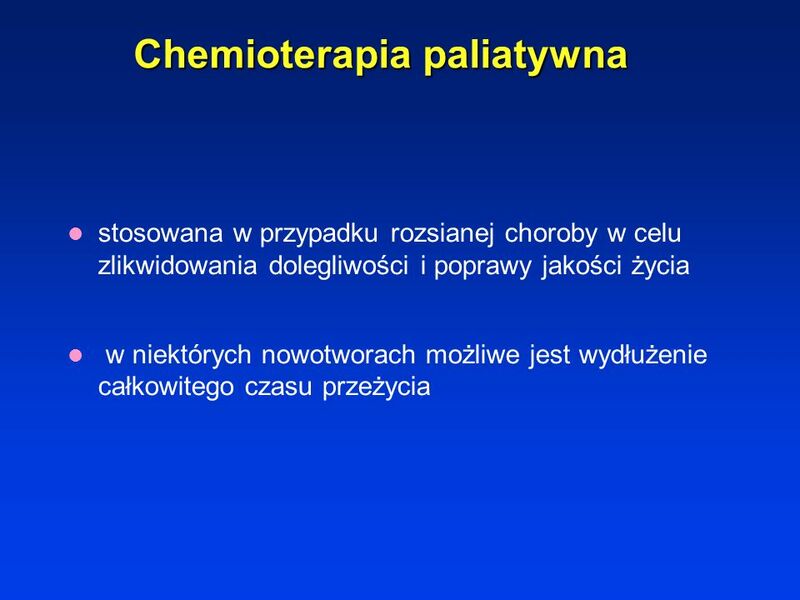 Cytotoxic Agents: Alkylating Agents: Classes Alkylating agents have long been essential components of many chemotherapeutic regimens. Five categories of these agents have traditionally been recognized. These include the nitrogen mustards (eg, cyclophosphamide and melphalan); aziridines (eg, thiotepa); the alkyl alkone sulfonate, busulfan; the nitrosoureas (eg, carmustine); and nonclassic alkylating agents (eg, procarbazine). The platinum compounds, carboplatin and cisplatin, can also be considered alkylating agents due to their mechanism of action. 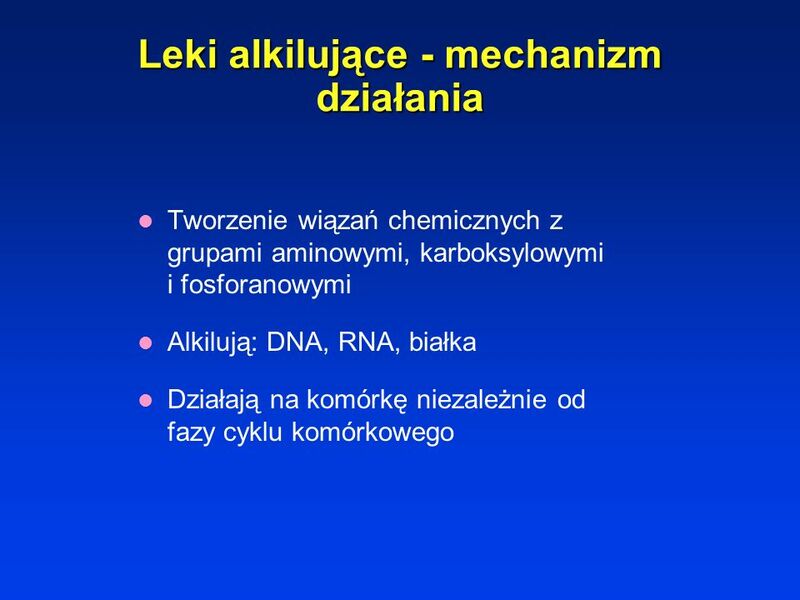 Tworzenie wiązań chemicznych z grupami aminowymi, karboksylowymi i fosforanowymi Alkilują: DNA, RNA, białka Działają na komórkę niezależnie od fazy cyklu komórkowego 4. 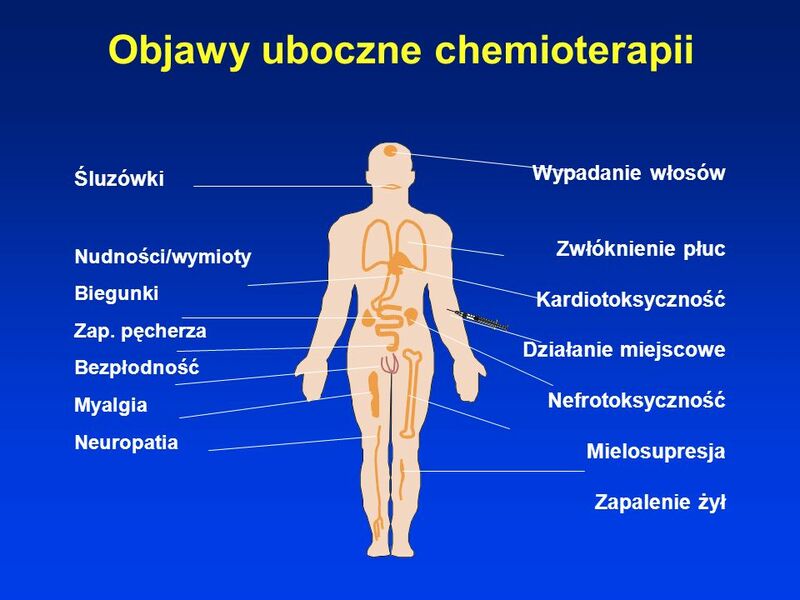 Cytotoxic Agents: Alkylating Agents: Mechanism of Action Alkylating agents used in cancer chemotherapy are polyfunctional compounds that may interfere with cellular processing of genetic material in several ways. The predominant action that leads to cytotoxicity is the alkylation of guanine at the N-7 position, which disrupts DNA replication, transcription of RNA, and other related cellular functions. The alkylating agents are cell-cycle–phase nonspecific because they interfere with cellular processes that are not dependent on the cell cycle. 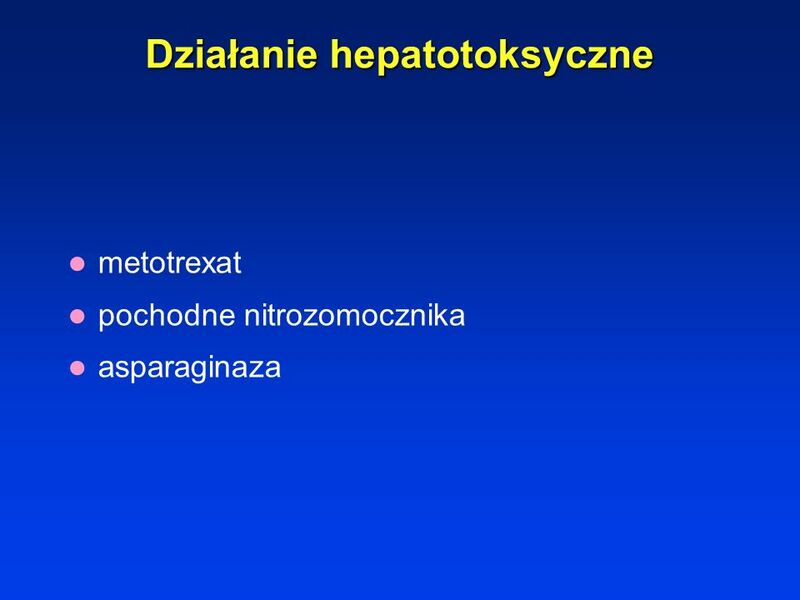 Antracykliny (doxorubicyna, daunorubicyna, epirubicyna, idarubicyna) Mitomycyna C Bleomycyna Daktynomyna Plicamycyna 5. 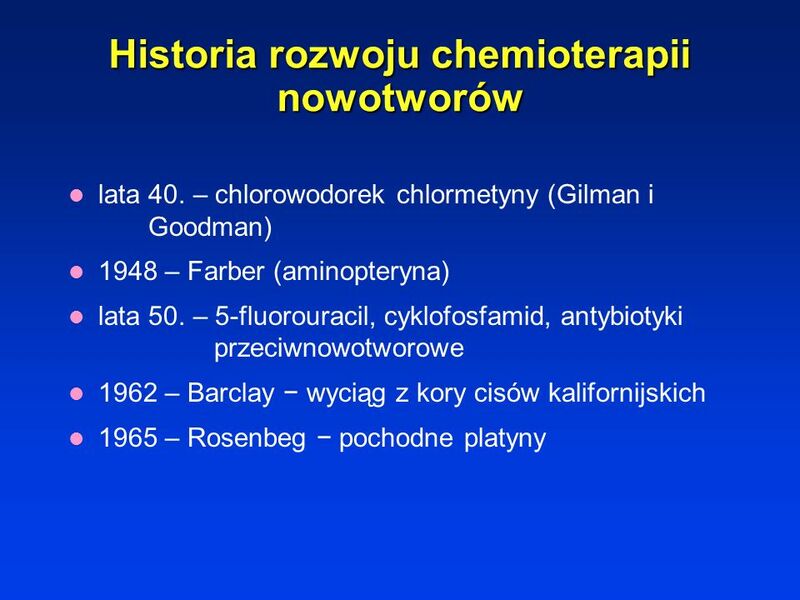 Cytotoxic Agents: Antitumor Antibiotics An array of antitumor antibiotics has been developed and found to be clinically useful. The anthracyclines are the largest group, represented by doxorubicin, daunorubicin, epirubicin, and idarubicin. Other agents include the anthracenedione, mitoxantrone, as well as mitomycin C, bleomycin, dactinomycin, and plicamycin. 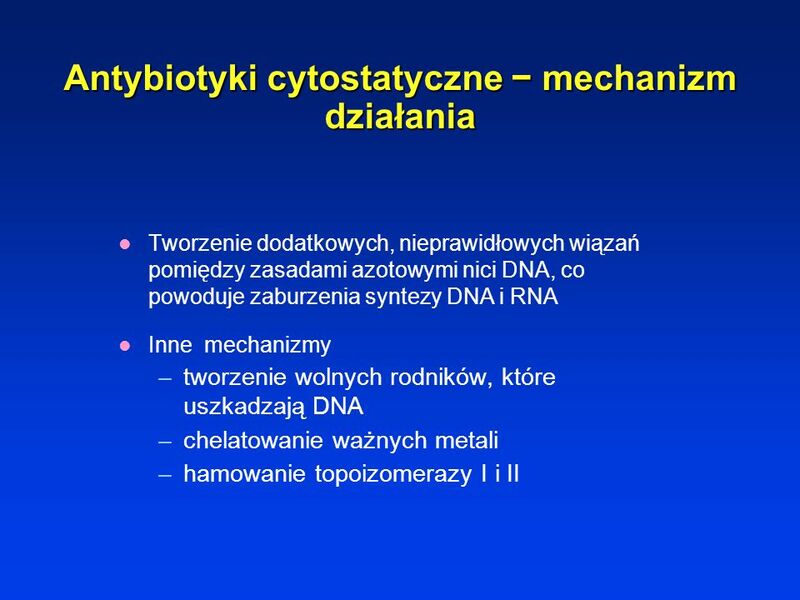 Tworzenie dodatkowych, nieprawidłowych wiązań pomiędzy zasadami azotowymi nici DNA, co powoduje zaburzenia syntezy DNA i RNA Inne mechanizmy tworzenie wolnych rodników, które uszkadzają DNA chelatowanie ważnych metali hamowanie topoizomerazy I i II 6. 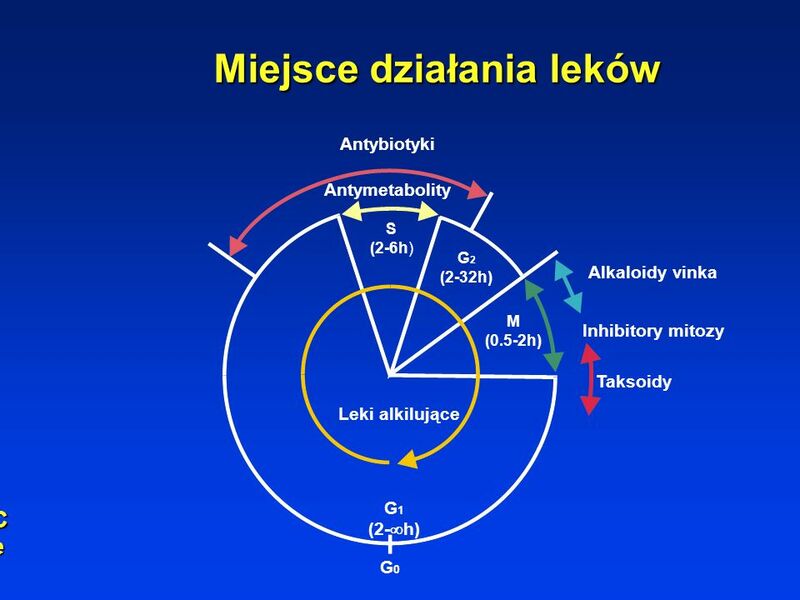 Cytotoxic Agents: Antitumor Antibiotics: Mechanism of Action The antitumor antibiotics can exert their cytotoxic effects through a number of mechanisms. The principal mechanism of these agents involves binding directly to DNA by intercalation, which causes uncoiling and breakage of the DNA helix and impairment of DNA and RNA synthesis. The contribution of other mechanisms, such as free-radical formation, chelation of specific metal ions with resultant oxidative cell damage, and inhibition of topoisomerase II in regions of transcriptionally active DNA, are also important for various agents within this class. 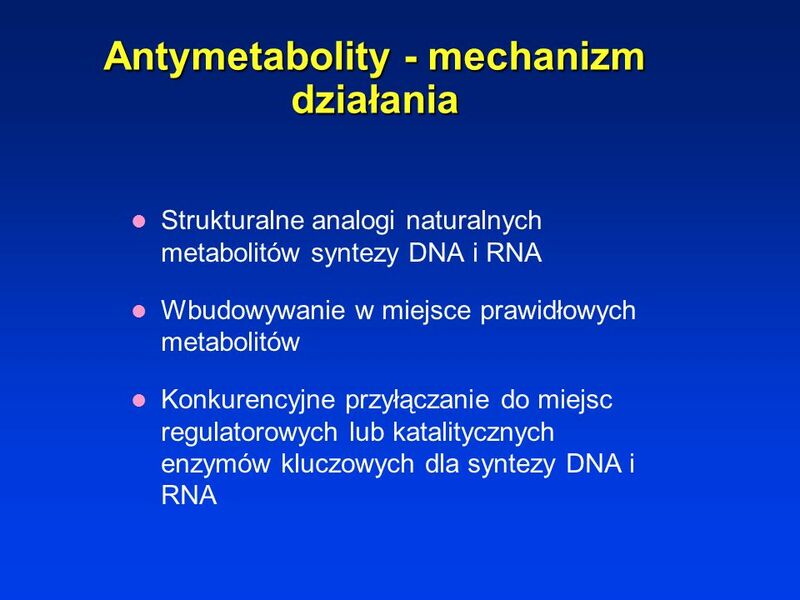 Strukturalne analogi naturalnych metabolitów syntezy DNA i RNA Wbudowywanie w miejsce prawidłowych metabolitów Konkurencyjne przyłączanie do miejsc regulatorowych lub katalitycznych enzymów kluczowych dla syntezy DNA i RNA 7. Cytotoxic Agents: Antimetabolites: Mechanism of Action The antimetabolites are structurally related to normal metabolites that cells require for basic functioning and replication. 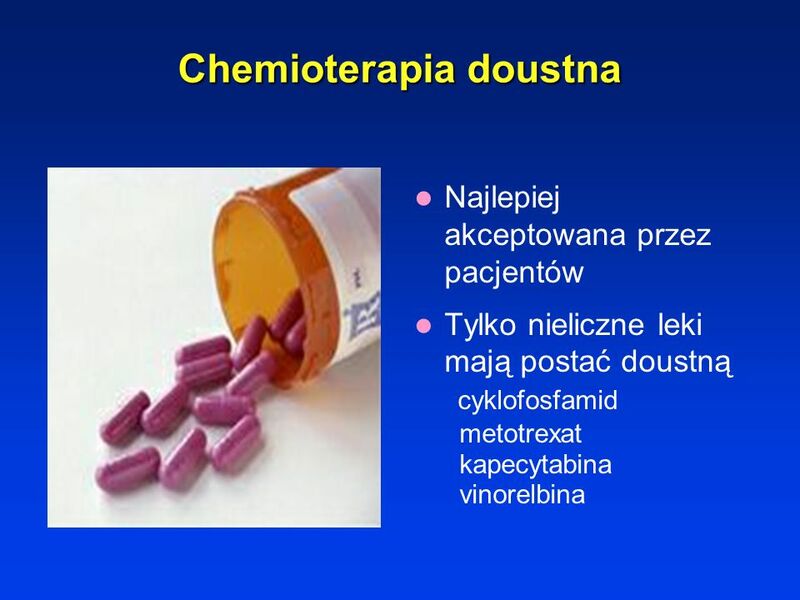 These drugs can exert cytotoxic effects through three mechanisms. They can replace normal metabolites in the structure of key cellular molecules, thereby impairing the function of those molecules. They can compete with normal metabolites at the catalytic site of key enzymes and interfere with the normal metabolic functioning performed by these enzymes. In addition, they can compete with normal metabolites at regulatory sites of key enzymes to change the catalytic rate at which the enzyme can work. Analogi puryn (fludarabina, merkaptopuryna, tioguanina) Analogi pirymidyn (fluorouracil, cytarabina, gemcytabina, kapecytabina) 8. 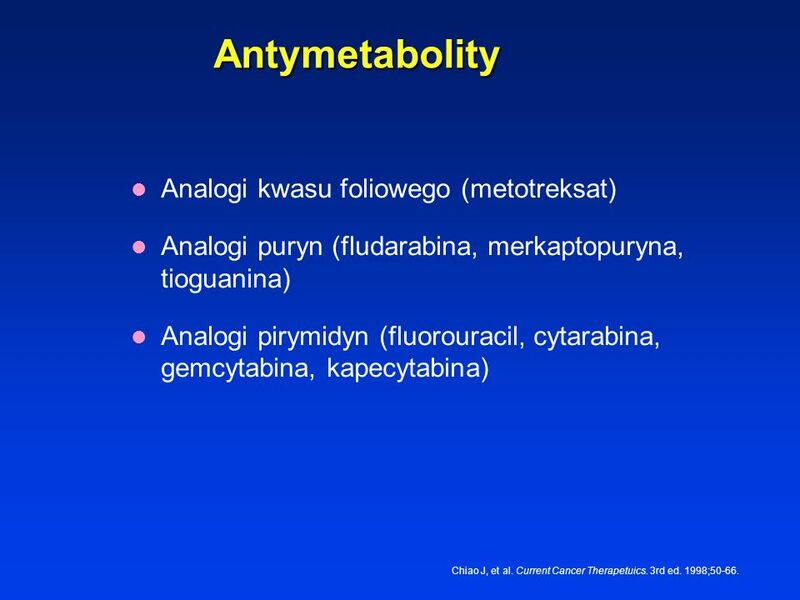 Cytotoxic Agents: Antimetabolites: Classes The antimetabolites are a large group of cytotoxic agents that have been in use since the late 1940s. Three major classes of antimetabolites have been described. The antifols were the first such agents discovered and, in the 1950s, methotrexate was the first drug of any kind used to treat patients with metastatic disease. The class of purine analogues includes thioguanine, pentostatin, and cladribine. The class of pyrimidine analogues includes fluorouracil (5-FU), cytarabine, and gemcitabine. Chiao J, et al. 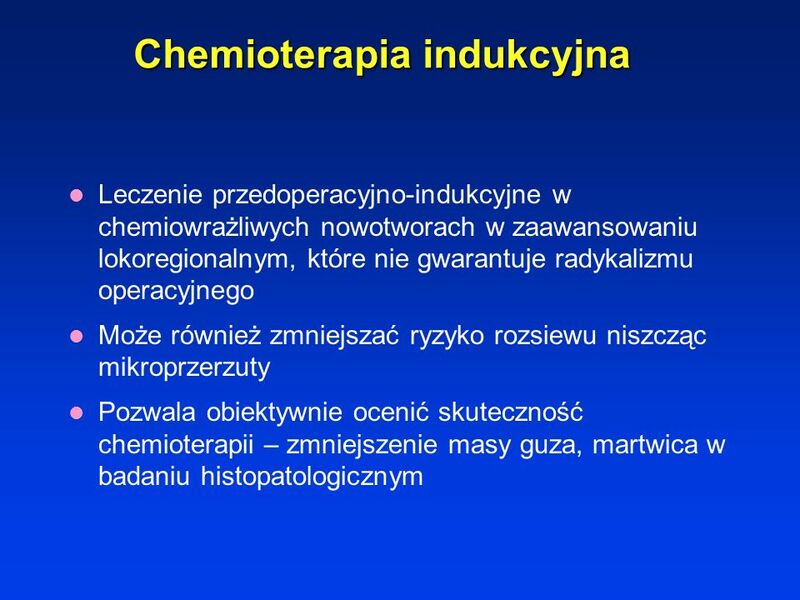 Current Cancer Therapetuics. 3rd ed. 1998;50-66. 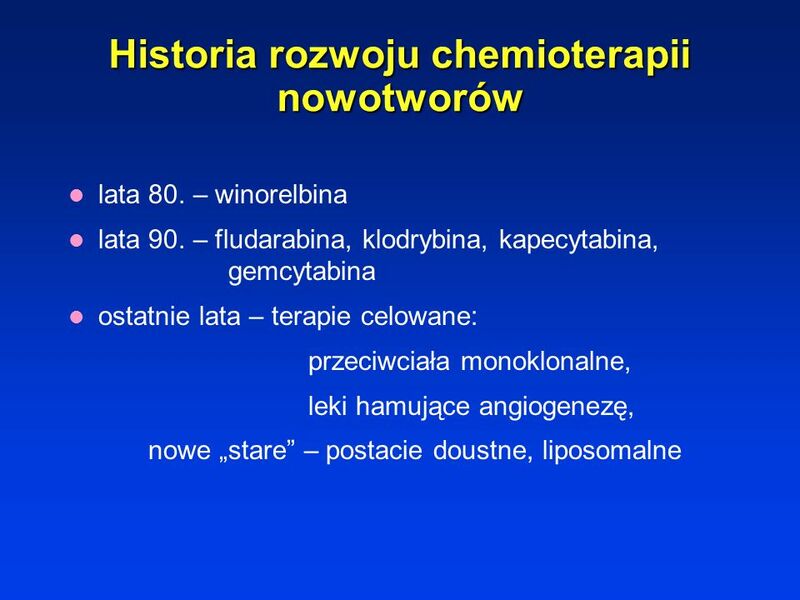 Alkaloidy barwinka różowatego (winkrystyna, winblastyna, winorelbina) Taksoidy 9. Cytotoxic Agents: Spindle-Tubule Inhibitors Rather than interfere with the cellular processing of genetic material, spindle-tubule inhibitors interfere with normal functioning of the mitotic spindle that is central to the process of cell division. 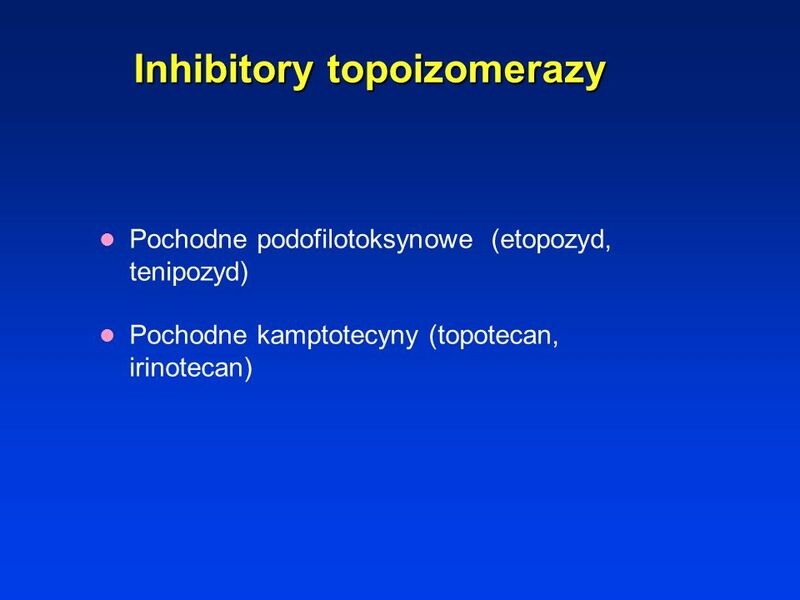 These agents include the vinca alkaloids and the taxanes. .
Pochodne podofilotoksynowe (etopozyd, tenipozyd) Pochodne kamptotecyny (topotecan, irinotecan) 10. Cytotoxic Agents: Topoisomerase Inhibitors: Classes The podophyllotoxin derivatives and the camptothecin derivatives target the nuclear enzymes DNA topoisomerase II and topoisomerase I, respectively. The activity of podophyllotoxin, which is obtained from the May apple or mandrake plant, has led to the development of two clinically useful derivatives, etoposide (VP-16) and teniposide (VM-26). 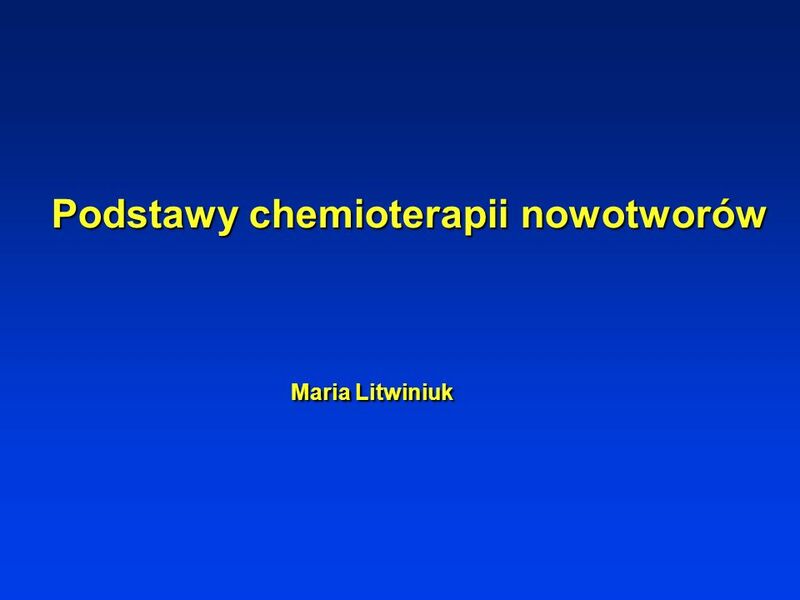 Camptothecin, which is obtained from a specific Chinese tree, is too toxic for clinical use, but has led to the development of two synthetic compounds, topotecan and irinotecan, which are promising newer agents. .
Wypadanie włosów Zwłóknienie płuc Kardiotoksyczność Działanie miejscowe Nefrotoksyczność Mielosupresja Zapalenie żył Śluzówki Nudności/wymioty Biegunki Zap. 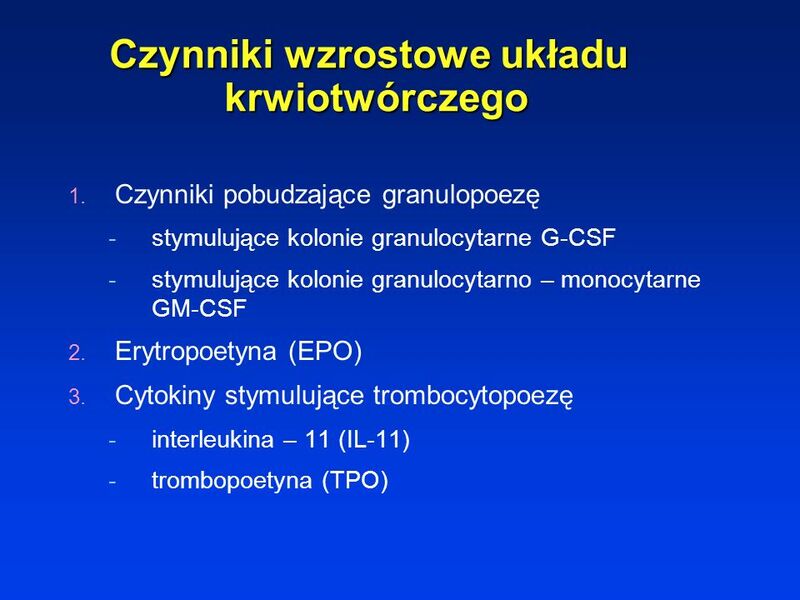 pęcherza Bezpłodność Myalgia Neuropatia 10. 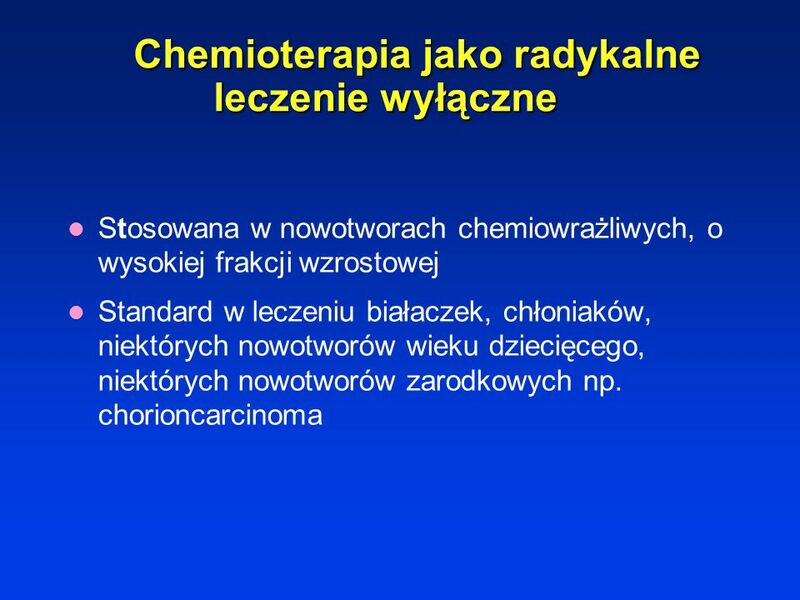 Principles of Chemotherapy: Side Effects of Chemotherapy There are multiple side effects of chemotherapy. Some are common, such as alopecia, neutropenia. 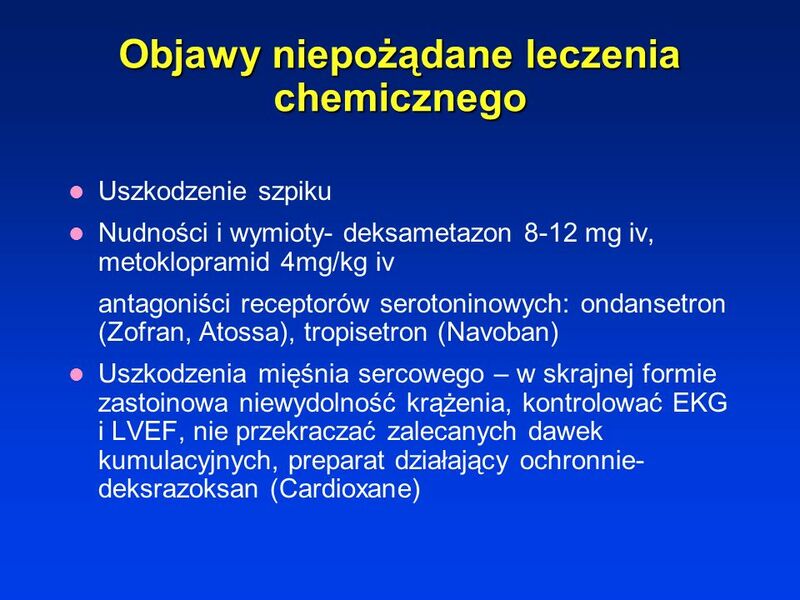 Some are rare such as cardiotoxicity. 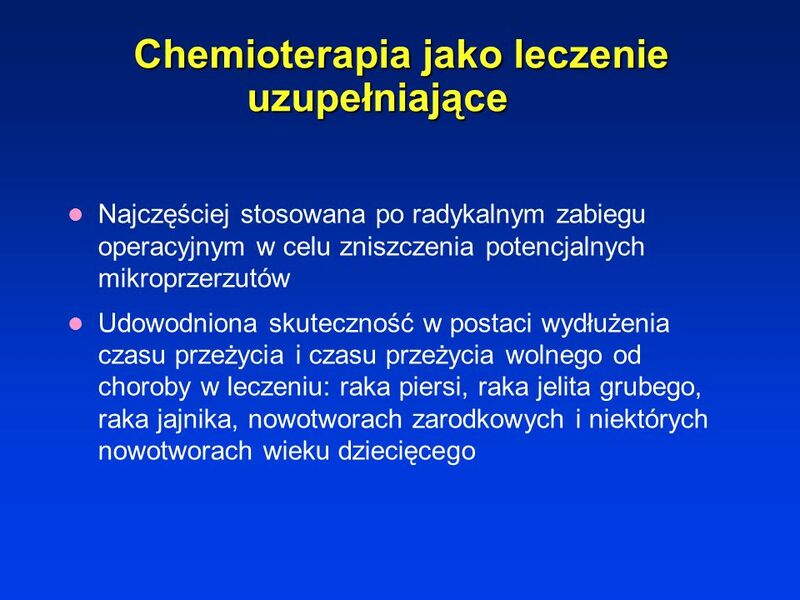 The side effects are generally the consequence of the cytotoxic effect of chemotherapy on normal cells, however they can also be related to the direct toxicity of the drug. 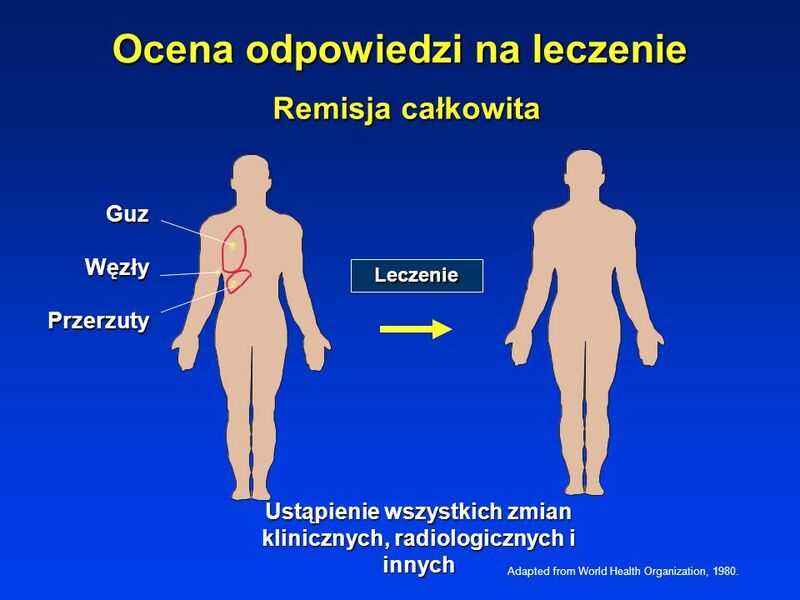 Remisja całkowita Guz Węzły Przerzuty Leczenie 9. 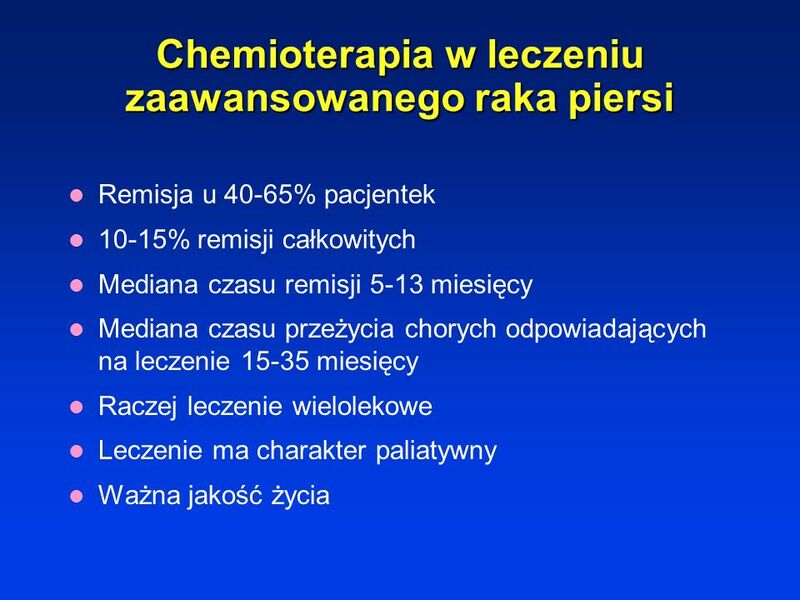 Drug Development: Clinical Endpoints: Complete Remission One criterion for evaluating response to chemotherapy involves degrees of remission from the signs of disease. A complete remission is a response to treatment in which all clinical, radiologic, and biologic signs of a tumor have been observed to disappear. All fields demonstrating the primary tumor, node-positive disease, and metastatic disease must be confirmed to be disease-free for designation as a complete remission. 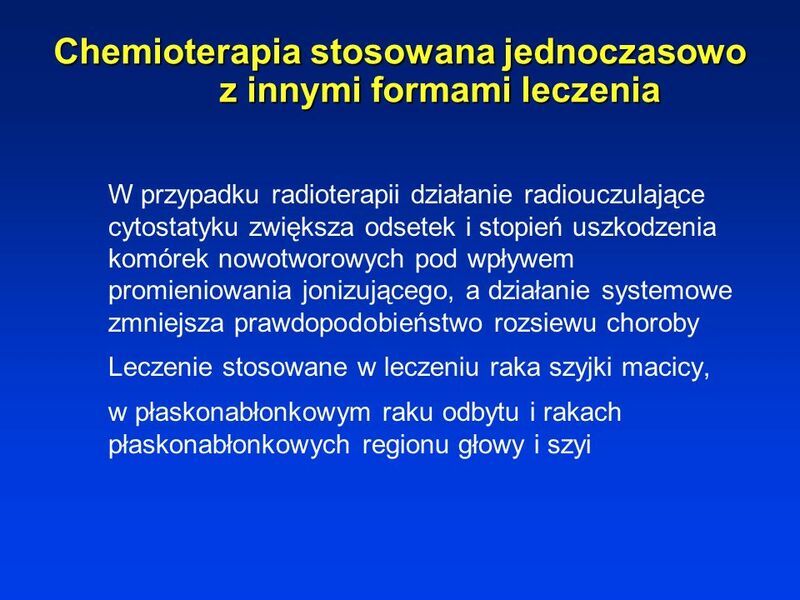 Ustąpienie wszystkich zmian klinicznych, radiologicznych i innych Adapted from World Health Organization, 1980. 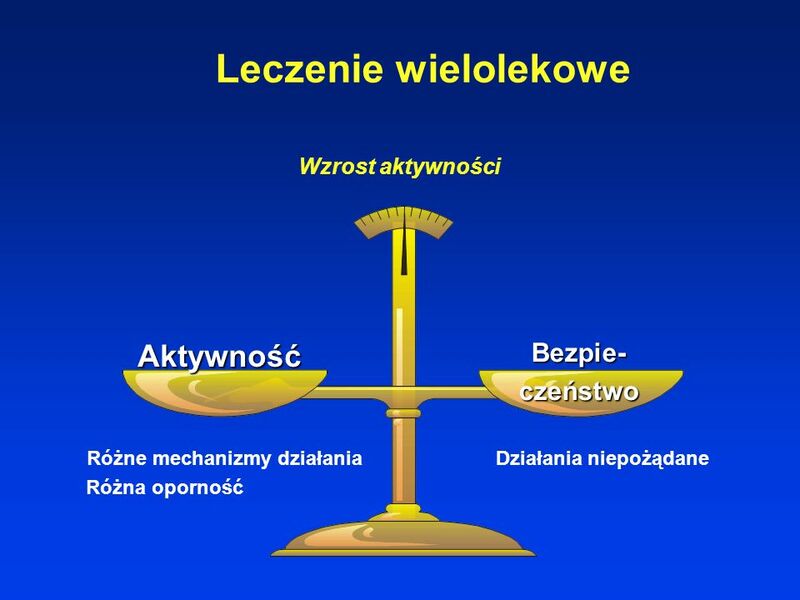 Częściowa remisja Leczenie 10. 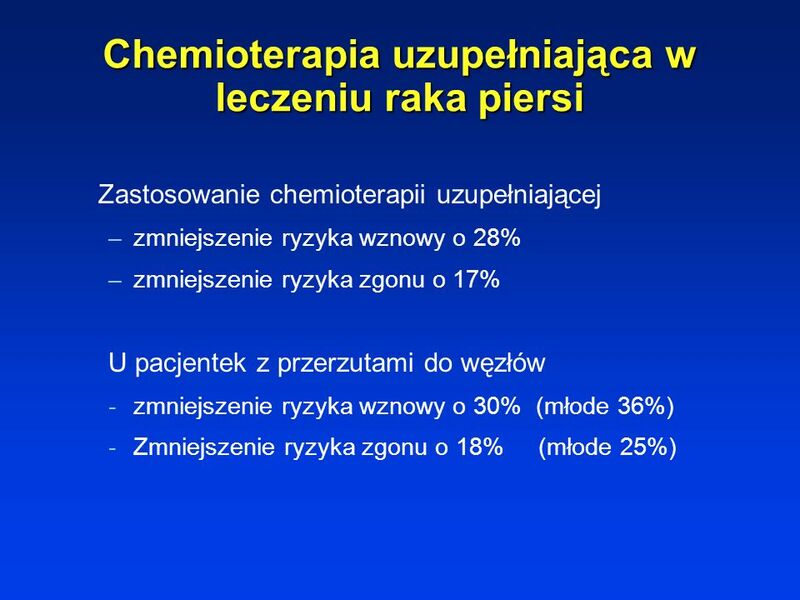 Drug Development: Clinical Endpoints: Partial Remission Remission that is less than complete may be designated as partial remission if the tumor bulk has been reduced by at least 50%. 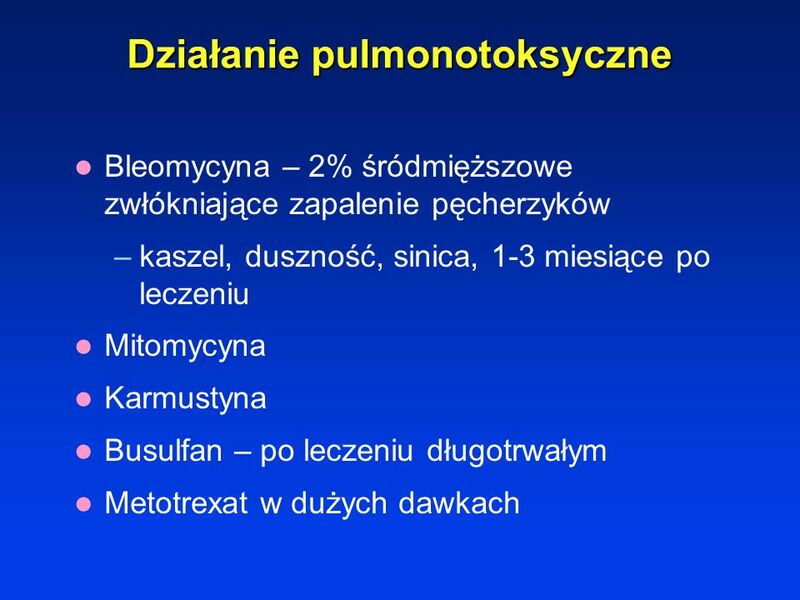 Zmnieszenie iloczynu 2 wymiarów guza conajmniej o 50% Adapted from World Health Organization, 1980. 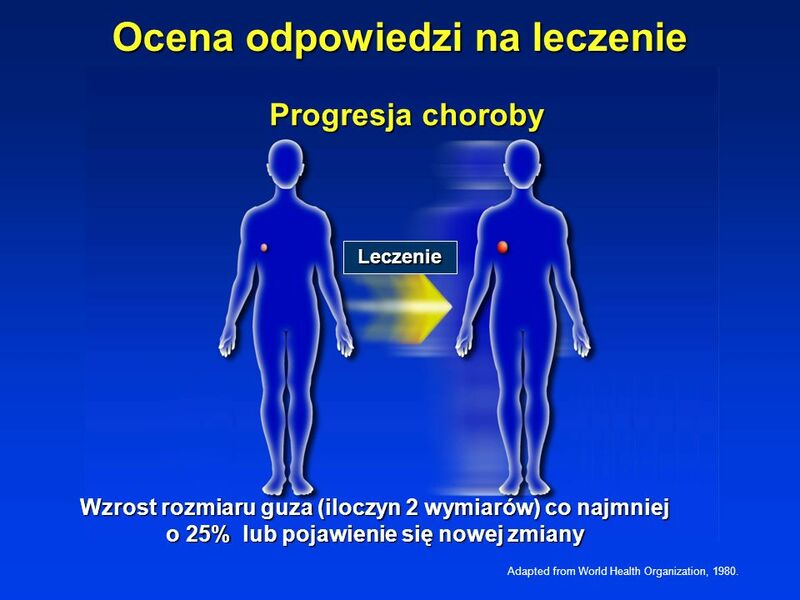 Progresja choroby Leczenie Wzrost rozmiaru guza (iloczyn 2 wymiarów) co najmniej o 25% lub pojawienie się nowej zmiany Adapted from World Health Organization, 1980. 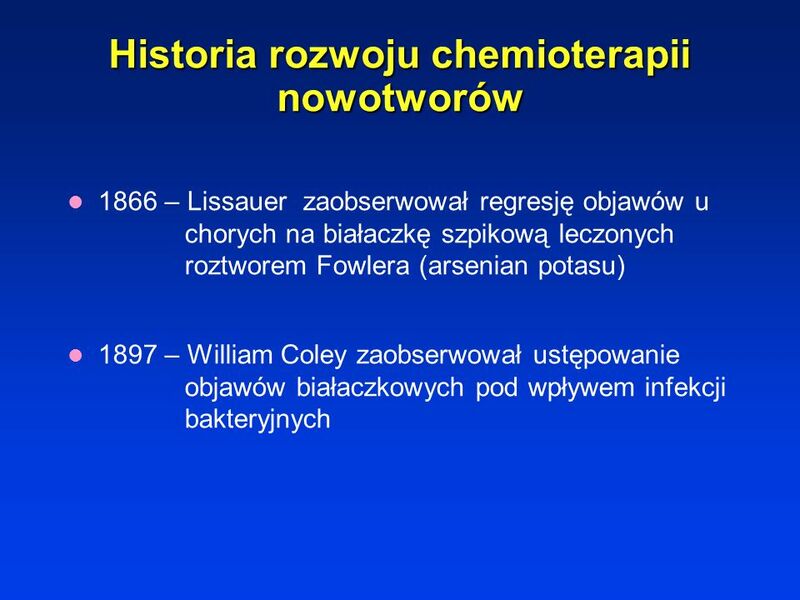 Pobierz ppt "Historia rozwoju chemioterapii nowotworów"